The last child in the woods is a book of great impact. The background for the book is how Richard Louv finds that children spend less time outside, playing in nature. He investigates this premise, the reasons causing it, suggests some possible effects and a way forward to ameliorate this problem. After its publication in the United States in 2005, its impact was tremendous and a slightly revised European version was published in 2009. It is this European version that is the basis for this review. Louv’s book was ground-breaking in the way it spoke of the relationship between children and nature, combining a background of scientifically based knowledge with personal anecdotes and selected quotes from literature. The aim was to make a book read by parents, changing their attitudes in the upbringing of their children, and it ended up with high sales numbers, excellent reviews, and an impressive number of scientific citations. The last child in the woods starts with describing how children are less in nature. This is explained by the increased protection by parents, media-induced anxiety, fear of litigation in the US, and environmental regulations. This is supported by calculations showing how much time children spend outside now, and quotes from parents explaining why they are not spending more time outside. The second part of the book aims to reveal the benefits children (and the rest of us) get by a close relationship with nature. In this part of the book, Louv explains both physical and psychological beneficial effects. He continues with elaborating how nature experiences stimulates our senses. He explains how knowledge about nature can be the basis for an “eight intelligence”, being “nature smart”. He further highlights the importance of nature to foster creativity before he ends this part exploring the connection between ADHD and similar issues, and limited exposure to calming nature experiences. In the third part, Louv explains the background for why, in his opinion, children are not that much outside playing in nature anymore. Starting with lack of time and fear of not succeeding, he shows how children spend more time in organized activities than in free play in nature, and how, consequently, parks and natural areas are rebuilt to soccer fields, escalating the trend. Another fear is also prominent in his arguments: “The fear of the bogeyman”. He expands his survey to the educational system; how the lack of natural knowledge leads to less value of the nature experiences, and continues to discuss which effect this will have on the formation of future environmentalists. In the last three parts of the book, Louv focuses on the way onwards, how nature, education systems and societies can be reunited with nature. Last child in the woods is an important book, and is important for the NaChiLit group as one of the fundamental books about the relationship between children and nature. As earlier noted, Louv’s book had great impact and spotlights important issues. There has, however, been raised some important critiques. First of all, the underlying assumption in the book, that children play less in the woods, seems to be rooted in experiences of Louv’s (and most of the researchers he cites) own youth. The ideal childhood of the book then seems to be the childhood of the white, male, middleclass children growing up in the 50’ies and 60’ies (Dickinson, 2013). The other, large underlying assumption, hits the central focus of NaChiLit’s research – the description of nature. As he talks about nature as something we could go into, and experience as wild places or natural landscapes, he separates between nature and humans. 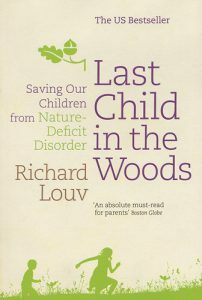 As Louv’s intention with Last child in the woods is to reconnect children with nature, there is an issue in that his foundation is a dichotomy between humans and nature.